In stark contrast to Indonesia, when you land in Malaysia you land back into an organised, structured world where things happen the way that you are used to. People drive properly and obey the rules of the road. 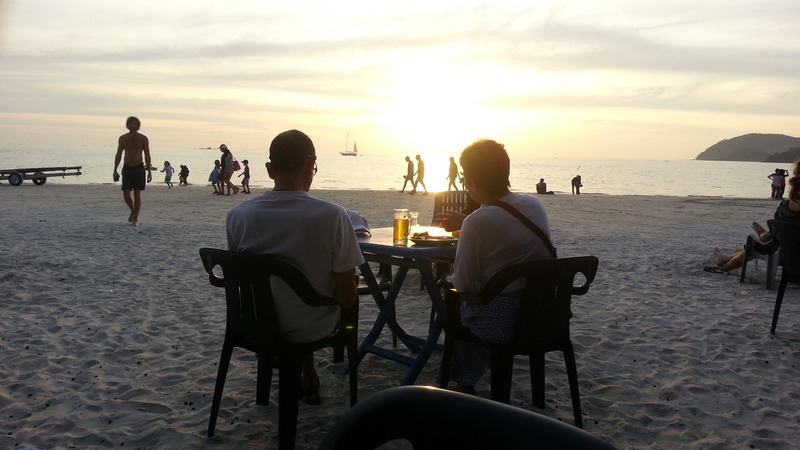 English is widely spoken and the locals are, generally, fluent in the Cenang Beach / Tengah Beach area. The need for queuing is understood and is, generally, executed with due care and attention. The minimum wage in Malaysia isn’t much different from that in Indonesia (see my write up on Gili Air for more details). Having said that, the Malaysians hardly ever harass you and there is very little’ hawking’. Unless stated otherwise, all prices are High Season prices. Regardless, you should always negotiate for better prices in Mid Season and Low Season. In many instances you can get HALF the High Season price. If you are staying for longer that 2 weeks, you have ‘negotiating power’. Although not as flexible as Indonesia, there is always room for movement downwards. 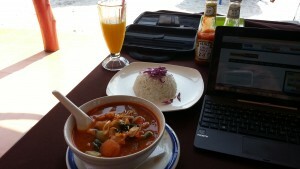 Free WiFi in Malaysia is normally of good quality and reliable. But you may still want the freedom of your own Mobile Data Plan (especially when you are relaxing on a remote beach or sitting in a local cafe). The consensus is that Maxis has the best network and that their Hotlink simCard is the best. Go into any shop with a Hotlink Logo and purchase a Hotlink package. Prices range from RM38 to RM68 per month for their average user packages (500MB to 2GB of data). You can also download their free app from the Play Store. However, once on Langkawi, an expat told me that Celcom have a better overall coverage on Langkawi Island. I tended to believe him as I had discovered for myself many areas on the island where I could not get a mobile signal (these areas tended to be in the hilly parts and in the center of the island). Kuah Town is grey and drab and I wouldn’t recommend staying there unless you particularly like town life and have transport. There are ‘guesthouses’ and ‘homestays’ down the west coast of the island (from Pantai Kok down) but they are, generally, all pretty basic – and you are far away from where the action is – so, again, only consider this option if you have transport. 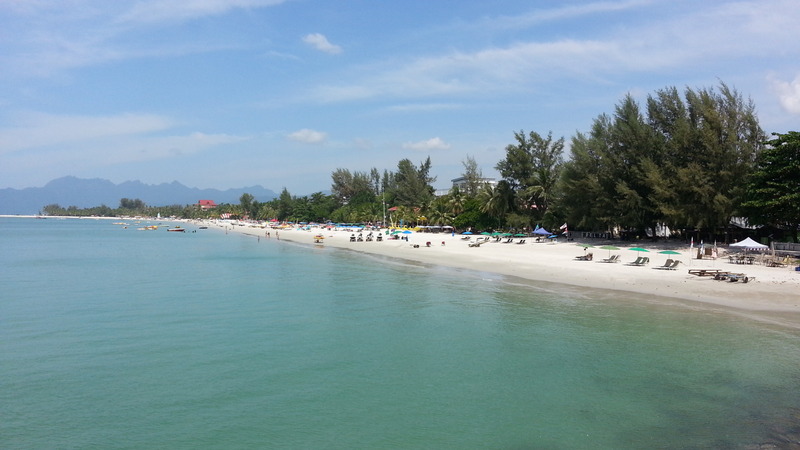 Cenang Beach is the main strip on Langkawi for budget and mid-range accommodation, restaurants, bars and shopping. Cenang Beach is naturally the liveliest place on the island. 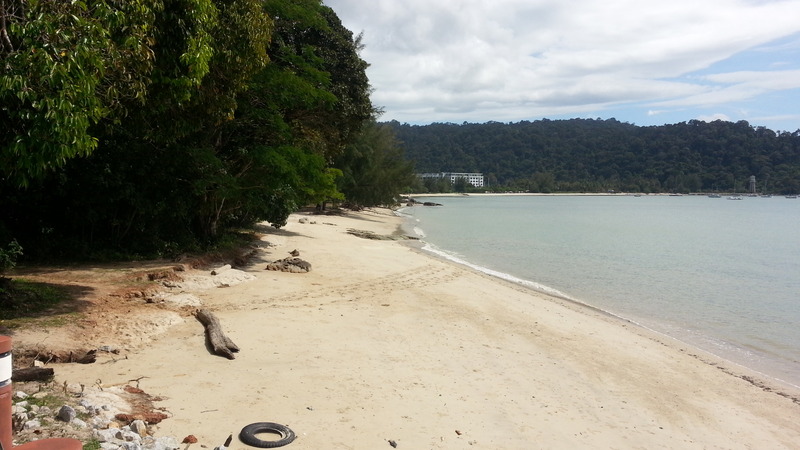 South of and adjacent to Cenang Beach is Tengah Beach which is also a good option. 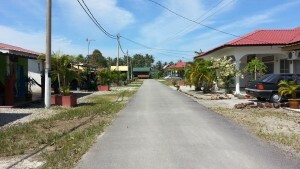 Jalan Bohor Tempoyak road runs parallel to Cenang Beach road about 300-400 meters further back from the coast. 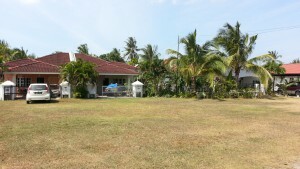 Many GRANDPAcking rental properties can be found in the maze of lanes between Jalan Bohor Tempoyak and the beach. However, some are not easily identified as rental accommodation so be ‘cheeky’ and ask. Likewise there are GRANDPAcking opportunities in the lanes set back from Tengah Beach road between the Sun Cafe and the Pari Pari Guesthouse. 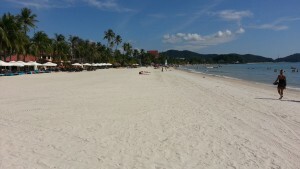 You cannot buy land in Langkawi; you can only lease it. Leases range from 10 to 20 years. A lease of 15 years is normal. In addition, Kedah District Law prevents all foreigners from buying property under RM2,000,000 / NZ$800k / US$600k / €480k / £400k. Such laws are throughout Malaysia (only the amount varies). Obviously, the Malaysians do not want foreigners competing for houses against locals in the lower price brackets. For this reason, most people who do not have a Malay spouse choose to rent. Rainbow Lodge rent out ‘chalets’ on a monthly basis. 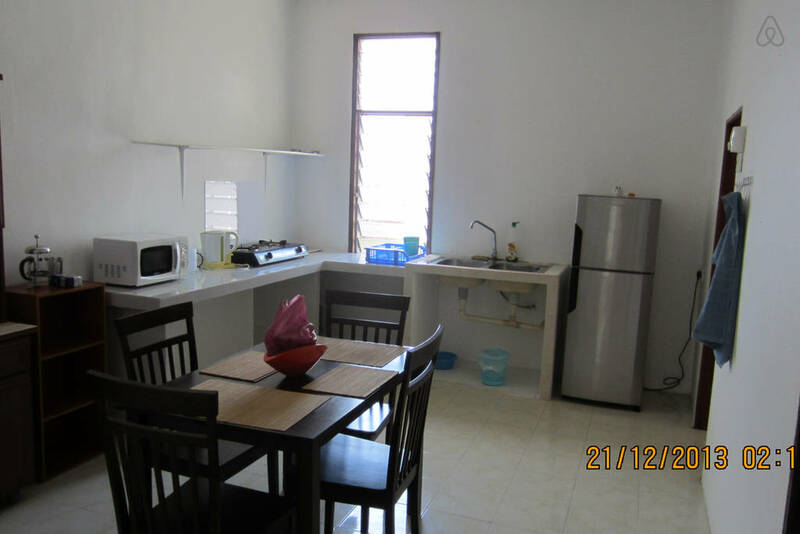 Starting at about RM2,400 a month (RM80 or NZ$32 per day) you can get your own 1-bedroom chalet with separate kitchen, en suite bathroom, free WiFi, mini fridge, kettle, toaster, hot water, aircon and (Malaysian freeview) TV. These units are very popular and they are usually pretty booked out from November through to April. Talk to Eddy (the Manager) and see what he can do for you. Sorry Eddy but, for us westerners, I would liken the long stay chalets to living in a slightly run down permanent caravan park. The grounds are a bit untidy, and the ‘chalets’ are getting old & tired. Rainbow Lodge have had some people living there for months… some of their guests have lived there for 2 years (they just do Visa runs to Thailand every 90 days). Some just come for 3-4 months each year as part of their ‘retirement locations cycle’. I would say that Rainbow Lodge offers ‘average’ accommodation for the price; there are better value ‘chalets’ in locations that are just as good as that of the Rainbow Lodge. Glenn & Carol’s: There are modern 1 bedroom villas in the back lanes from Cenang Beach road going for as low as RM1500 per month. 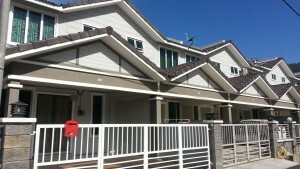 2 bedroom villas go for as low as RM2000 per month. Glenn & Carol have 10 such properties but only 3 are listed on AirB&B – so contact Carol and ask. You can get to some of them via AirB&B: https://www.airbnb.co.nz/rooms/1849519. 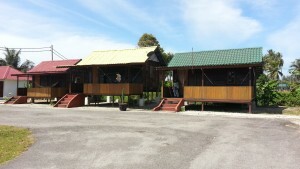 These chalets are more modern than Rainbow Lodge and ‘on a par’ with Bohok Villas. At this price, these types of properties are few and getting harder and harder to find – so they book out fast. You are, probably, best to book online months in advance (if you walk in off of the street you may be disappointed). 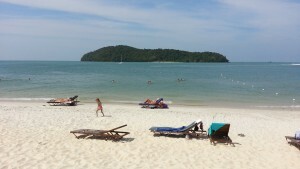 If you are staying several months, why not be ‘cheeky’ and ask for a long term discount? Bohok Villas on Jalan Bohor Tempoyak itself, rent at RM3500 per month for villas that are more modern than Rainbow Lodge’s. 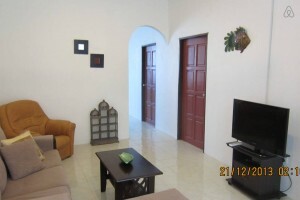 They are so booked out with short term rentals (through Booking.com) at RM120 / night that they do not need to discount for longer term rentals at all. 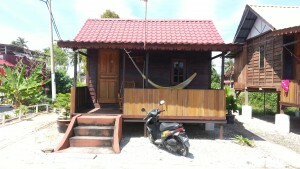 Their sister facility Bohok Guesthouse next door offers ‘Units’ for RM1800 / month. These both offer hot water, aircon, fridge, kitchen facilities, tv, and free wifi. You should be able to easily find modern 1 bedroom furnished apartments around the island going for RM1500 – RM1800 per month. If you are prepared to get right out into the wop wops, you may me able to find a 3 bedroom furnished house for as little as RM1300 – RM1500 per month. You can get furnished rentals in a local Kampong (away from Cenang Beach) for about RM1200 per month but you will likely be the only expat living amongst the locals and house break-ins of such expat rentals do happen. 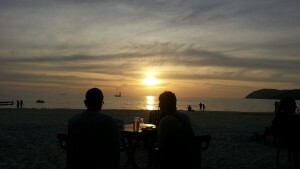 The online Langkawi Gazette (http://langkawi-gazette.com/) advertises long term rentals. You can pay RM1,800 (NZ$720) to RM2,500 (NZ$1,000) for some very nice furnished places as long as you stay for a minimum of 3 months. Utilities are on top of that and depend on actual usage. If you are looking to buy, check out www.langkawilife.com. You pay RM100 / month for satellite TV. You should budget RM100 / month for standard utilities. You should add another RM100 / month (or more) if you want your aircon on all day every day. 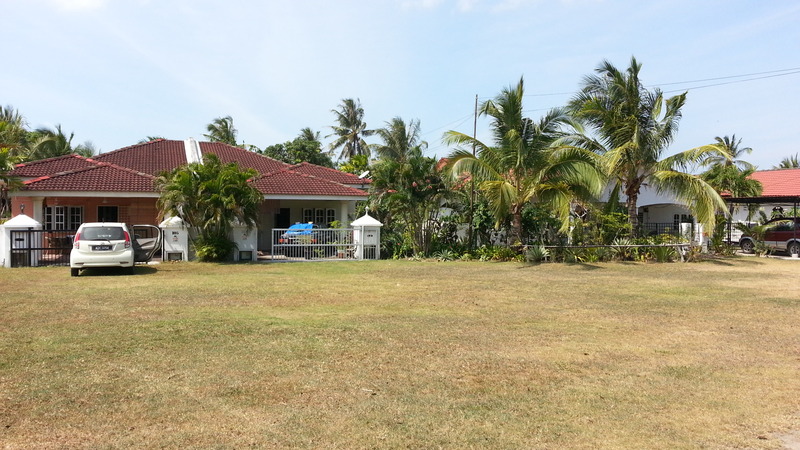 I met one expat who bought a new 2 bedroom apartment on the coast near the airport about 5 years ago. He bought it for RM250k / NZ$100k / US$75k / €60k / £50k. His Body Corp costs total about RM250 / month. He loves it but he will never be able to sell it to a foreigner because of the new RM2m minimum value law. So, he plans on keeping it and handing it down in his will to his children as a holiday home. The public transport system on the island is poor. The taxis are comparatively expensive. If you manage to get GRANDPAcking accommodation in or around Cenang Beach / Tengah Beach, then you may be able to get by on foot – or by renting (or buying) a couple of bicycles. You can, then, rent a car or scooters by the day for day trips around the island. However, if you are further out of town, the best option is to long-term-rent a car or scooter(s). The ‘published standard rate’ on the street for a scooter is RM35. 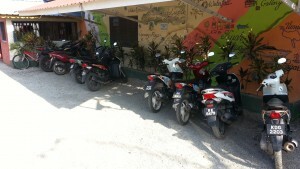 Your accommodation may also rent out scooters – sometimes they will do so at a discounted rate for their guests. As always, deeper discounts are easily available for longer term rentals. You can rent scooters long term for as low as RM12 per day. GRANDPAckers would need 2 of those at RM24 per day. You are warned to drive VERY slowly and carefully at night because of animals (e.g.Water Buffaloes) on the road. The long term rental of a small economy car can be had for as little as RM600 (NZ$240) per month. Make sure that this includes your insurance (either through the car rental company or through your visa card or travel insurance). RM100-RM200 a month should cover your petrol (depending on how much you drive). I met one expat who had bought himself a very tidy and well kept Daihatsu Terios. It was early 2000s with 200,000kms on the clock – he got it for RM6,000. On the Cenang Beach road, I’m talking RM10-15 for eggs on toast for breakfast… RM20-30 for gourmet burgers… RM10-12 for a Shawarma… RM50-60 or more for a steak / seafood meal. You would really need to eat ‘local’ to stay within a GRANDPAcking budget. Good local cuisine can be had for RM6 – RM12 and you can still find such places along the main Cenang Beach road. How much longer these places will survive is another matter. If the ones on the main drag start to disappear, you will find many within 1-2km in the side roads and back roads. This is where the need for your own Transport kicks in. 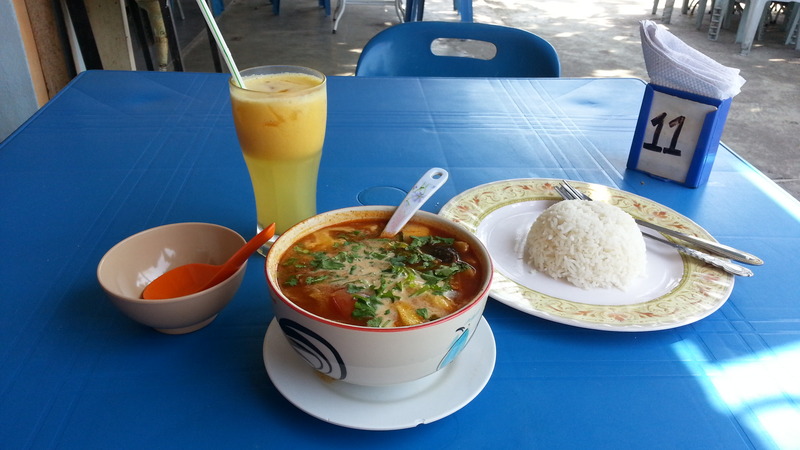 A typical dinner in a local restaurant / cafe would be Tom Yam Gai soup for RM8, white rice for RM1.50, and fresh Orange Juice for RM3 – a total of RM12.50. Up the west coast where route 115 meets route 114, you will find the popular expat haunt ‘Mangoes Restaurant’ which gets excellent TripAdvisor Reviews. Cans of Tiger are only RM4, House Wine RM7, shorts RM7, and cocktails RM15. On Sundays you can get a ‘bubbly’ or Bloody Mary for RM10 (to help cure that hangover). Their meals range from Schnitzel RM16 to many RM20s dishes to T-Bone Steak at RM41 – to that you have to add RM7 sides. They also have a quiz night once a month. This is one of the good places to start meeting the expats on the island. As always, if you want the cheaper options… look for where the locals eat. There are a couple of places near Orkid Ria where you can get a Roti Chanai for RM1 (I LOVE freshly made Malaysian Roti!). If you head down to the junction where Cenang Beach meets Tengah Beach, you will find 2 or 3 local restaurants about 50 meters up the road worth a try. Cheap, smorgasboard lunches in Indian Restaurants are common. If you have rented a scooter, why not get away from the touristy Cenang Beach area and discover some of your own favourite haunts. Good prices can be had in all sorts of places within 20 minutes drive of Cenang Beach. Drive 5km up the coast to find street food vendors next to the airport with tables on the beach – for RM3 you can get a tasty fish Laksa and for RM1.50 a coconut and ginger shake. For RM5 you can get a whole coconut with ‘the works’ – they chuck in all sorts of little lollies and they even chuck in peanuts..
Night Markets: Every night in Langkawi there is a large night market at a different spot on the island. 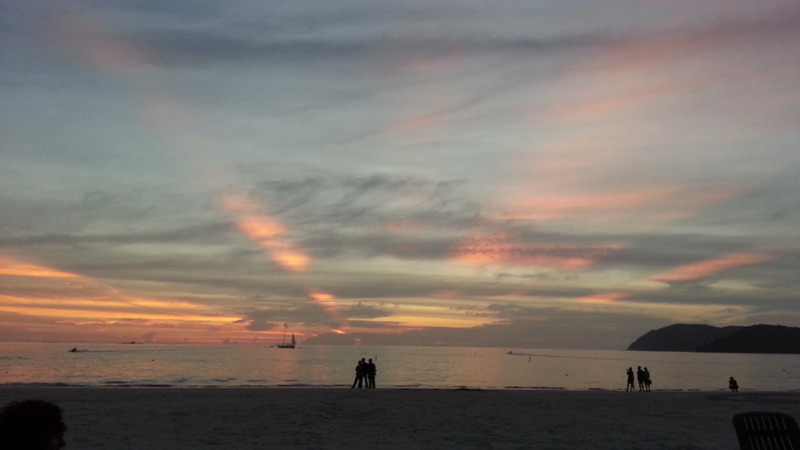 Cenang Beach market is Thursday night. Bars (and their reputations) can come and go so quickly. But, as a guideline, the restaurant on site at Rainbow Lodge sells 320ml cans of Skol for RM3 and Tiger for RM4. Not bad considering they are ice cold – a Skol costs RM1.90 and Tiger RM2.20 in the mini marts. 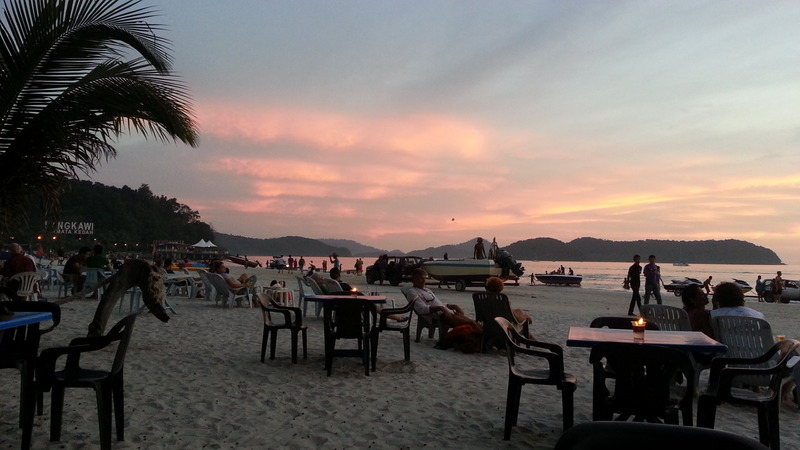 Langkawi is not a party island. 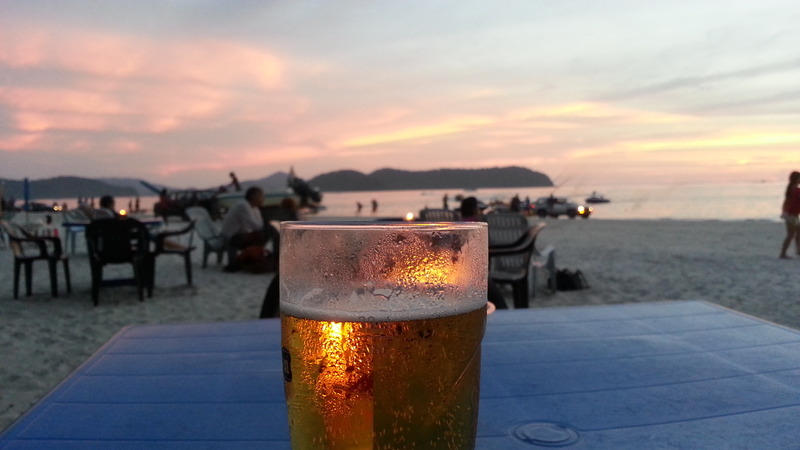 Alcohol is cheap and there are some great little bars where you can chill out. The ‘fun’ bar in Cenang seems to be the Ruang Bar, right in the middle of the main strip. It can get a bit loud (and the customers a bit pissed) as the night goes on. It is essentially a wooden bar built onto the outside of a small mini mart. The drinks are cheap. A can of Skol goes for RM5. 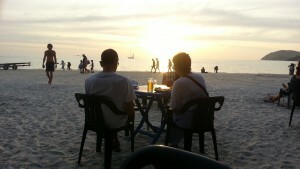 Another option is one of the cute and cheap places on the beach where you can relax and watch the sunset. 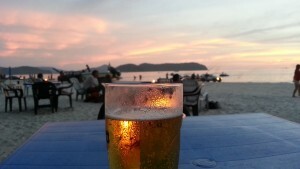 Little Lylias Beach BBQ: RM5 glass of draft Tiger and RM7 draft Heineken. Jug of draft Tiger RM20. Rafii’s next door to Little Lylia’s does several types of canned beer and draft Tiger for RM4 – and play some great classical rock music off the radio. OMG (Duty Free Mall): Have a 50% off 8 hour Happy Hour from noon to 8pm. They need to as a glass of draft Tiger in happy hour is RM6 (making it RM12 aft 8pm!). BUT, they have flat screen TVs at the bar showing sports (if you are prepared to pay the silly prices). There aren’t many Karaoke places in Langkawi but you can find one next to the Sunba Retro Bar in Tengah Beach. And, of course, if you have rented a place with a mini-fridge you can always stock up with cheap beer from the Duty Free Mall. You can get a slab of 24 for as little as RM40 (Skol) and RM50 (Tiger). 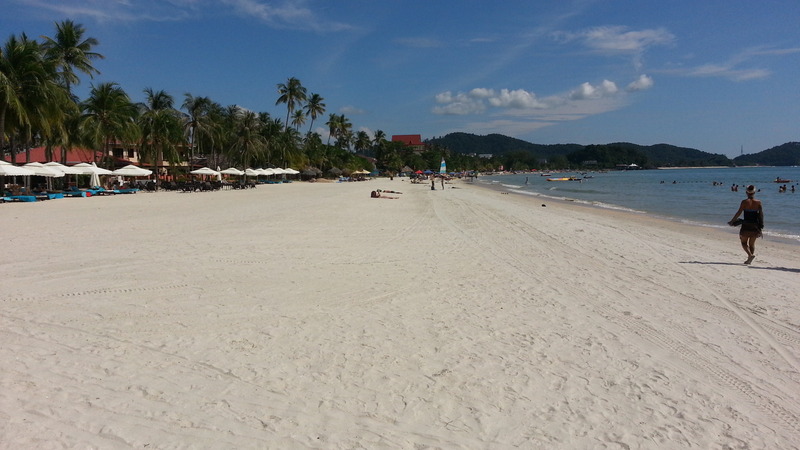 I can honestly say that the shopping in Langkawi is awful. There is no ‘shopping center’ and you pay western prices for goods. As for Cenang Beach… you just get tired of shop after shop selling the same stuff and even more tired at looking at T-Shirts. The Cenang Night Market isn’t that great either. You can usually bargain to a reduced price for merchandise at street markets – sticker prices generally apply for items in shopping malls. If there’s no barcode or price tag, then by all means start negotiating. Keep in mind that you’ll catch more flies with honey than vinegar – smile as you haggle and you’re more likely to get deeper discounts. The best way to get the best price on an item you’re coveting is to walk away – you’ll definitely be called back for last ditch offers. 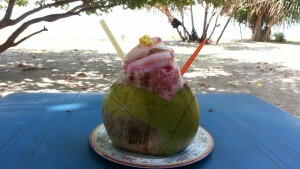 STREET STALLS: Whole coconut drink with ‘the works’ RM5. Meal RM3-4. Fruit drinks RM1.50. Fruit juices RM3. LOCAL CAFES: Roti Canai RM1. Curry with Rice RM4-6. Cup of hot tea or coffee RM1.50. CENANG RESTAURANTS: Curry with Rice RM9-10. Cup of hot tea or coffee RM2. Can cold Tiger RM7. Glass wine RM12. NIGHT MARKET: Finger food RM1-2. Meal RM3-4. LOCAL MINIMARTS: 1L shower gel RM8. 250ml mouthwash RM10. 600ml bug spray RM10. 80ml Shampoo RM5. DUTY FREE: 24 Skol Beer RM40. 24 Tiger Beer RM50. Bottle of Whiskey RM25 – two for RM40. OTHER: Cenang Beach Deckchair hire RM10 / day. You will notice immediately that Langkawi has top quality roads with very few potholes. In addition, drivers are considerate and obey the rules of the road. This makes driving a scooter around very safe. However, you still have your own responsibilities and risks when driving a scooter. This is true when driving a scooter anywhere. My advice is to take extra care anyway and ALWAYS look in your rear view mirrors… you dangers are just as likely to come from behind you as they are ahead of you. One of your most common risks will be that there is a car behind you waiting to overtake; the local drivers get up ‘very close’ behind you whilst they wait for their opportunity. The car will overtake when able and will do so without any regard for any obstacle that you have in front of your scooter… if you have to swerve to miss a man-hole cover, this is when you can get yourself into trouble – you will have absolutely no room for movement. KNOW WHO’S BEHIND YOU at all times and drive accordingly. 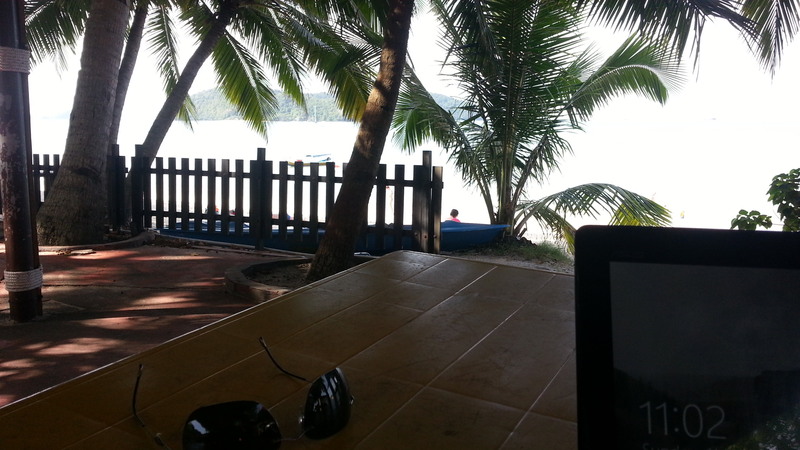 The locals around Cenang Beach are friendly but business like. They have seen Cenang Beach become a tourist center in just a few years and must see so many tourists come and go that they come across as being a bit ‘numb’ to it all now. As is normally the case, the further you get away from the main tourist areas, the more genuinely friendly people get. If you pop into one of the local cafes on the side of the road, you will see them watching you, smiling at you, the ladies giggling like girls about something, and being attentive. You get the feeling that they really do want you to be OK whilst you’re in their cafe. There is almost NO hawking on Langkawi. You don’t get harassed by trinket sellers. You can relax on the beach without being asked if you want a massage every 5 minutes. The only time that you get approached is at night when they try and tempt you into their restaurant. I don’t want to alarm you unnecessarily, but Jellyfish have become an increasing hazard for a large part of the year. In the High Season, uninformed visitors are stung every day and the lifeguards on the beaches and the hospital treat cases of jellyfish stings most days. In some cases, these are severe. 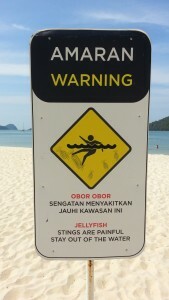 Box Jellyfish are particularly dangerous. BOX JELLYFISH ARE RARE and the beach lifeguards will warn you if and when they are around. The seasons and tides determine the most dangerous times for swimming. You are advised not to swim at night – the worst time for Jellyfish is said to be about 2-3am. The best time for swimming is VERY EARLY am around sunrise. You might strike lucky in your own resort but, out on the street, Sports Bars are hard to find. I went to Debby’s Irish Bar (Tengah end of the Cenang main drag) to watch an EPL game but didn’t stay. For a start they had no irish beer, there was no-one there, and I baulked at paying RM7 for a can of beer. You will not be dis-appointed with Cenang Beach itself. 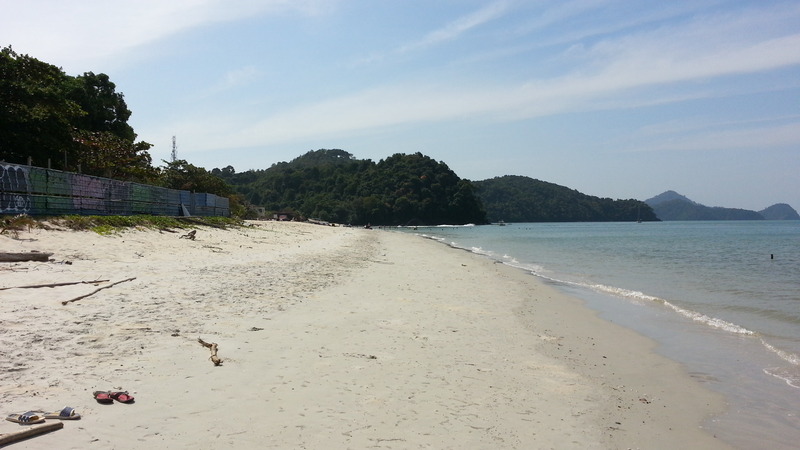 Cenang Beach is fine white sand stretching as far as you can see. Cenang Beach is better than Tengah Beach. 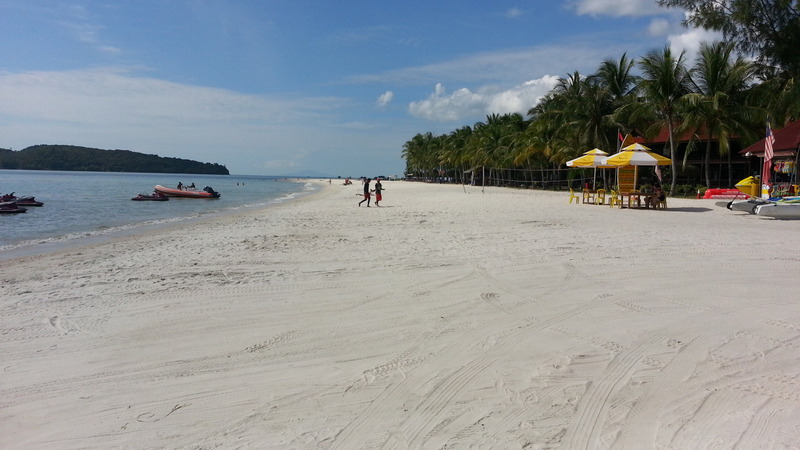 The beaches are busy with water sports – especially jet skis. For safety, areas are cordoned off for swimmers. These are swimming beaches… these are not snorkeling beaches. Get on your scooter and discover some nice beaches up the west coast. 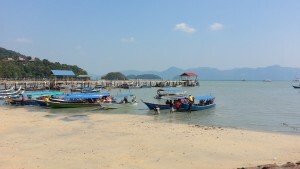 Pantai Kok is on the far western stretch of Langkawi. than Cenang or Tengah and enjoys a very intimate feel. The beach itself is beautiful with clean sand and clear waters, a thoroughly modern marina (Telaga Harbour Park) with a string of good shops, bars and restaurants, plus a petrol station, bank and post office. The local restaurants at Telaga Harbour are a pleasant location for breakfast or lunch. Or you can always venture even further to the north coast (another 10km) where you will find even more beautiful beaches with hardly a person on them. 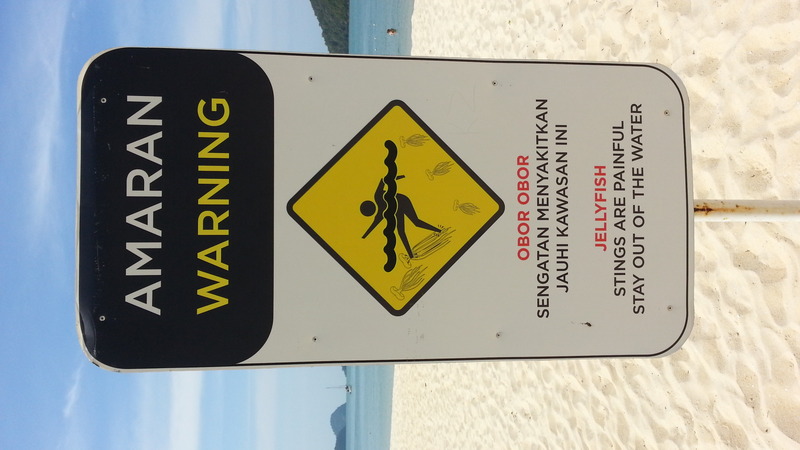 There are no Scuba Diving spots around Langkawi. 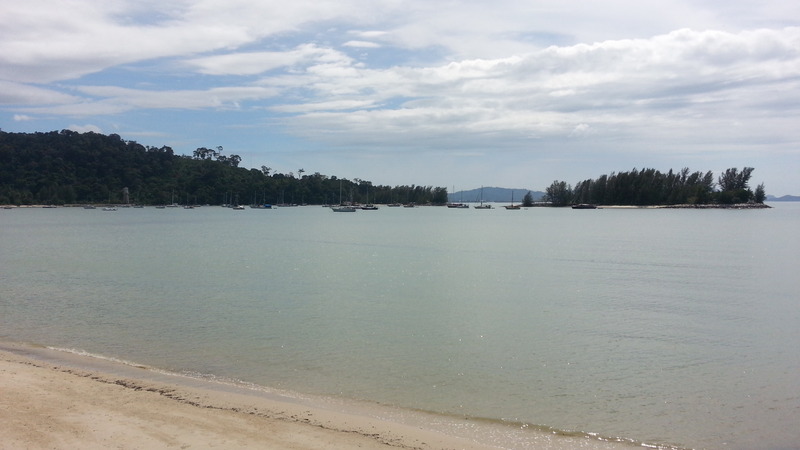 The nearest decent spot is Pulau Payar which is about 40 minutes away by ferry. Or, you can always take a trip to Ko Lipe in Thailand which is about 45-60 minutes away. Membership is RM1800 per year. Each time you play, you are required to use a golf buggy. Buggies cost RM80 to hire. 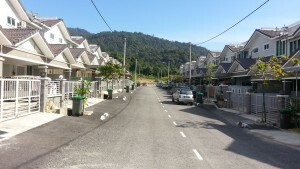 Casual golfers can expect to pay RM400 for a round ‘walking in off the street’. This cost includes club hire and mandatory buggy hire. If you play with a Club Member, a cost of a round will be about RM130 (excluding club hire); buggy hire is ‘on top’ and, usually, shared with your playing mates. You can happily live / retire on Langkawi all year round. High Season is between mid-November and mid-April, which corresponds to the dry season. You can retire comfortably on Langkawi BUT beware… (if you don’t drink alcohol) your ‘funds available for living‘ will not be as good as some other places (e.g.Gili Air) and you may find yourself drifting further and further into the wop wops each year in order to keep within your GRANDPAcking budget… Langkawi is changing that fast! Over the coming years, Langkawi will complete its transition from a Backpacker Paradise to a Mid Range (plus) Holiday Destination. Budget accommodation has already been ‘pushed’ away from the beach and, now, resides 200-400 meters back from the main drag. With the trends already happening at places like Rainbow Lodge and Bohok Villas, long-term rental discounting will stop and prices of private en-suite chalets and hotel rooms (with aircon) within walking distance of the beach will standardise at RM120 per night plus. 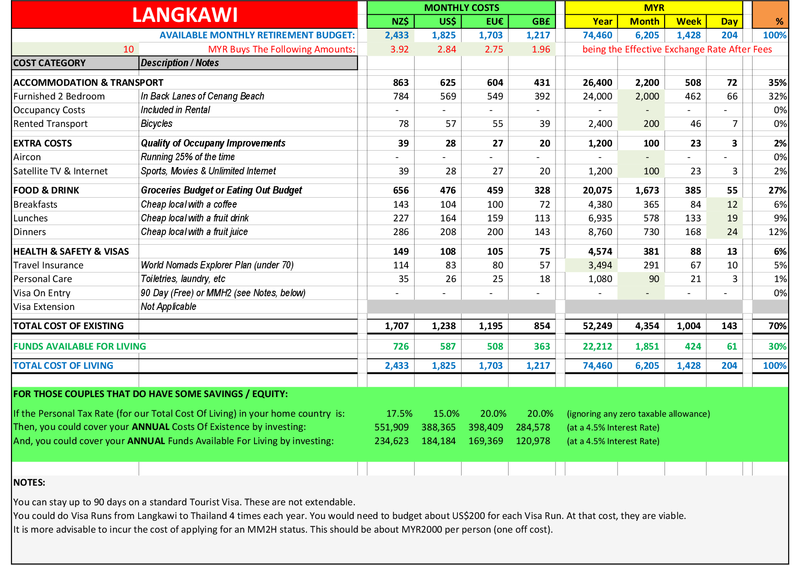 Over the next 5-10 years you will see the budget accommodation pushed out further from Cenang Beach further and further into the wop wops – where transportation will become a must. WHAT WOULD YOUR RETIREMENT BUDGET BE? THE GRANDPAcking ACID TEST: Can a retired couple with no assets live easily, comfortably, and happily here with their only source of income being a standard NZ Married Couple’s State Pension? YES. 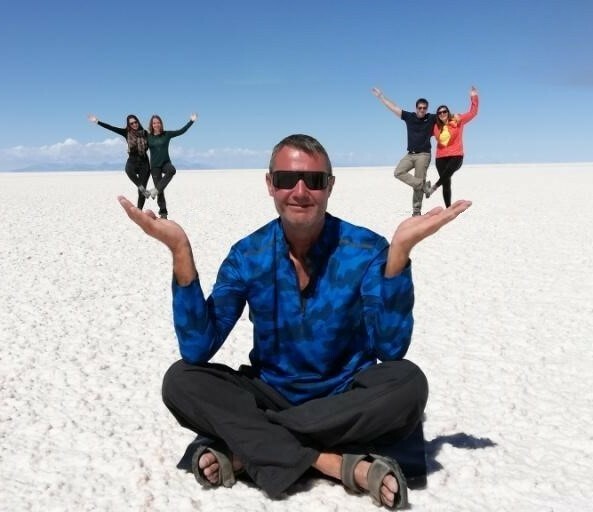 If you find some close friends who want to share one of the upmarket accommodation options and go halves on car costs, you can bring the budget well within the GRANDPAcking target budget; but, for many, this is a major compromise.